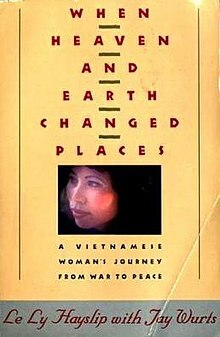 When Heaven and Earth Changed Places is a 1989 memoir by Le Ly Hayslip about her childhood during the Vietnam War, her escape to the United States, and her return to visit Vietnam 16 years later. The Oliver Stone film Heaven & Earth was based on the memoir. The book was written with Jay Wurts, a Bay Area-based writer and editor. Hayslip's memoir was hailed as a previously neglected look at the war from the perspective of the Vietnamese peasants whose lives were upended. A review in The Washington Post wrote that, "to Americans, almost always, the peasants of Vietnam were part of the scenery of the war, no more." The book was also praised for its message about the horrors of war. A review by Pulitzer Prize-winning writer David K. Shipler for The New York Times wrote "If Hollywood has the courage to turn this book into a movie, then we Americans might finally have a chance to come to terms with the tragedy in Vietnam." The Washington Post reviewer wrote: "It should not be missed by anyone -- especially anyone who still thinks there is anything noble or glorious about war." The memoir was first published on April 29, 1989 by Doubleday. The book was later published by Plume in May 1990. In 1993, Plume published a tie-in edition (ISBN 0452271681) to accompany the release of the film Heaven & Earth. In 2003, Plume published a new edition of the book (ISBN 0452271681) with a new afterword from Hayslip. Oliver Stone had previously made two films about the Vietnam War, 1986's Platoon, which won the Academy Award for Best Picture and Born on the Fourth of July. Stone won the Academy Award for Directing for both films. Both films were told from the perspective of Americans. Platoon was based on Oliver Stone's own experience in Vietnam and Born on the Fourth of July was based on the experiences of veteran Ron Kovic. After Platoon, Hayslip would stand outside movie theaters in San Diego, where she lived at the time, and hand out fliers. "I am not against the movie," Hayslip said, "But I want them to know that 3 million of my people died in that war too." Stone had been a United States Army soldier in Vietnam in 1967 and 1968. Hayslip was living and working in Da Nang, Vietnam at the same time Stone was stationed there and they have speculated that they possibly crossed paths. Stone read her memoir when it was published in 1989 and felt that his look at the Vietnam War was incomplete without telling the story from the perspective of the Vietnamese. He optioned the book and the film was released in 1993. The film version was also based in part on Hayslip's second book, Child of War, Woman of Peace, about her adaptation to life in the United States. The film was not as well-received as Platoon or Born on the Fourth of July. ^ a b c d Jack Mathews (1993-12-23). "The Road to 'Heaven and Earth'; How Le Ly Hayslip's Personal War Inspired Olive Stone". The Los Angeles Times. ^ a b David K. Shipler (1989-12-31). "A Child's Tour of Duty". The New York Times. ^ a b c d e Arnold R. Isaacs (1989-07-16). "Vietnam: The Sorrow and the Pity". The Washington Post. ^ "A Different Kind of Vietnam Veteran, and Her Healing Mission". The New York Times. 1989-11-28. ^ Desson Howe (1993-12-24). "'Heaven and Earth'". The Washington Post. Retrieved 2007-07-21. This page was last edited on 12 April 2019, at 06:08 (UTC).